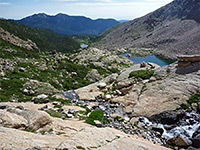 While the full 8 mile, 4,885 foot climb to the top of Longs Peak is too strenuous for most people, a good appreciation of Rocky Mountain National Park's highest summit can be had by hiking the easier path to Chasm Lake, situated in a glacial bowl beneath the steep east face, surrounded on three sides by precipitous slopes of rock and scree, part of which holds a permanent snowfield (Mills Glacier). 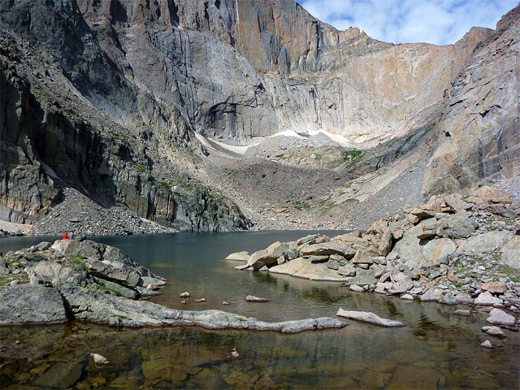 This trip is 4.2 miles in length, gaining a still significant 2,360 feet, yet is never particularly steep; the lake is reached by a short spur that leaves the Longs Peak route after 3.2 miles. About two thirds of the hike is above the treeline so the views are good most of the way, across the eastern slopes of the Rockies and further east towards the Colorado plains. This section of the national park, although not within the main area (and accessed without need for payment), is often rather busy, and the lake is not a destination for those seeking solitude, though it is very beautiful. 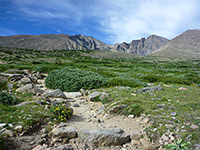 The majority of traffic on the main trail is for Longs Peak, however, either the summit itself or the base of the final, semi-technical section, the Keyhole Route. Rocky Mountain National Park map, Chasm Lake and Longs Peak topographic map. 16 views along the trail to Chasm Lake. The one mile side road to the Longs Peak trailhead forks west off Hwy 7, nine miles south of Estes Park. Like all such roads in the vicinity, even though the route passes through national forest land, it is lined by private residences, and there are no places hereabouts suitable for free primitive camping. The road ends in a parking area, near a tent-only campground, both of which are usually full; cars often have to be left up to half a mile back, on narrow verges. One reason for the place filling up early is because of the average round-trip time for the Longs Peak hike - 10 to 15 hours - so many people start well before dawn. The busy trailhead includes a staffed ranger station and information office. The trail to Chasm Lake/Longs Peak is of course broad, well trodden and easy to follow. 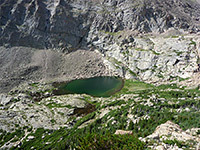 It first has a moderate climb of half a mile through medium density pine woods to a junction, where the main path is signed to Chasm Lake and Longs Peak; the other, less used branch is north to Eugenia Mine and Storm Pass. The Longs Peak path becomes just a little rockier underfoot, switchbacking upwards then straightening, to the brink of a small stream (Alpine Brook). More zigzags are followed by a flatter section, past the Goblins Forest camping site, all the while encountering little change in the forested surroundings. A brief gap in the trees is provided by an open slope of fallen boulders, on the north side, then soon after the stream comes into view once more, lined by bluebells. The trail cuts back over Larkspur Creek, a small tributary, then crosses Alpine Brook. Just beyond, a notice announces the imminent arrival at the start of the tundra zone, above the treeline, where the vegetation changes quite abruptly to dwarf pines then just grass and many wildflowers (especially purple asters), mingled with whitish granite boulders. The next minor junction, beside the upper part of the brook, is with a spur a short distance up Battle Mountain, location of another primitive campsite. Chasm Lake is now just 1.7 miles away. The path continues up a wide, gently sloping boulder field - Mills Moraine, as the views become steadily more impressive. Longs Peak is directly ahead, visible once out of the forest. The cairned trail steepens somewhat up to the crest of a ridge, where the Chasm Lake Trail branches off into the upper end of the valley of Roaring Fork, on the south side of the moraine. A smaller lake (Peacock Pool) soon comes into view 200 feet below, though Chasm remains hidden until right at the end, behind a line of low granite cliffs. The trail rises slightly, traversing the side of the ridge then descends gently, passing mostly unvegetated grey boulders (a stretch that holds snow until quite late in the season), and crosses a tiny stream harboring many blue-purple flowers of Colorado columbine. It winds down to the brink of the appropriately named Columbine Falls, more of a cascade than a waterfall, on the stream between Chasm Lake and Peacock Pool. The waters split into several thin channels, edged by moss and wildflowers. The final steep part of the path is up a granite slickrock escarpment to the shore of Chasm Lake, which looks very deep and is enclosed by grey cliffs and boulders, with streaked granite slopes rising up to 2,000 feet above. Mount Meeker is south, Longs Peak southwest, and Mount Lady Washington north, but there is no chance of climbing much further at this point - the summit trail takes quite a long diversion northwards to avoid the steep terrain above the basin. However a faint trail does circle the northern lakeshore and ascends a little way to the base of Mills Glacier.